Characteristics: Varietal cacáos in a unique & non-traditional formulation. So what exactly is it? A spread? A dip? A sauce? Fudge, móle, ganache, fine frosting… some lotion, gel or face cream?Soft chocolate? Spoon chocolate? Chocolate butter? Whipped chocolate?Really now, what is it? A spreadable ganache… but with a difference. The coconut difference.Nova swaps out adding any cocoa butter for expeller-pressed coconut oil instead. Not quite a solid, coconut oil can be likened to water’s various phases (liquid / solid / vapor). It reduces the melting point of a chocolate by about 10ºF (noticeable in the Mouthfeel), thus galvanizing a quicker release & generating a cool tongue; quite distinct & pleasurable in the main.Very clean too, Nova’s particular oil only modestly imparts its own flavor to taste almost clarified, serving more as a canvas that absorbs the cocoa compounds, then carries them forward beyond their weight in cacáo-content.A real crowd-getter that only looks ‘quick ‘n easy’ because a lot of preparation has gone in behind it to get the sensory profile right. 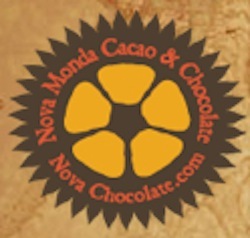 Impact: Nova Monda, esperanto for ‘New World’.As the company’s “Chocolate Czar” — Joseph Zarr — explains it, ‘Nova Monda’ jokingly ploys off the U.S. military usage of the phrase in their tactical exercises for the ‘enemy’. 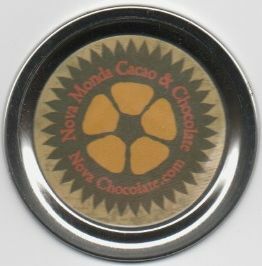 As such, the troops at Nova Monda loosely see themselves as members of the New Earth Army.Pretty apt in light of cacáo’s history in the “homeland“.Seizing upon that chocolate lore & the European experience in the Americas, this company is setting out to conquer the world of the new era chocolate but striving mightily to do so ethically & responsibly (organic, directly-traded &/or partnered) in concert with locals — in the ’20/20 Zone’ of the cacáo belt around the Earth — rather than in combat against them.Nova Monda seeks to carefully tend to the craft, from the tree to the post-harvesting, & all the way thru to the processing.